All of the tabs have Airtable Linked Fields for cross referencing information. For example, the facts view has a linked to the Jury Instructions table. By linking facts to individual jury instructions, you can get a quick summary of all facts supporting or opposing the particular legal issue. The great thing about Airtable is the flexibility. You’re not locked into somebody’s predetermined ideal about what case analysis should like for you. The flexibility/customization can be a bit daunting (a bit like looking at a blank page when you need to first start writing a brief). But, after playing around with Airtable for a bit, you can really begin to leverage this flexibility, get creative and start to make connections in your case. Also, it’s great for working with other team members or getting someone new to the case up to speed quickly. Really, the only beef I have with Airtable at this point is the lack of off-line accessibility. The best part about Macs is the ease of upgrading to new hardware. In the old Windows days, an upgrade to new hardware meant hours lost reinstalling applications, hunting down serial number and praying to the software licensing gods that there wouldn’t be some crazy limitation preventing you from installing software you already purchased on your shiny new computer. With a Mac, the ability to easily transfer an entire user environment (apps, data, settings) from the old hardware is dead simple. But, recently, I came into possession of an iMac. Not having worked from a desktop in a very long time, I decided to do a clean install of OS X and then track which apps I was forced to install first. Notably, you can get quite a bit of work down without installing anything. OS X’s built in Mail, Calendar, Preview (reads PDFs) and Address Book get you up to speed fairly quickly, and for free. But, it also didn’t take long to start needing other stuff to get the job done quickly, and more comfortably. So, from first installed to last, here’s the list of essential Mac OS X apps used in my daily routine. 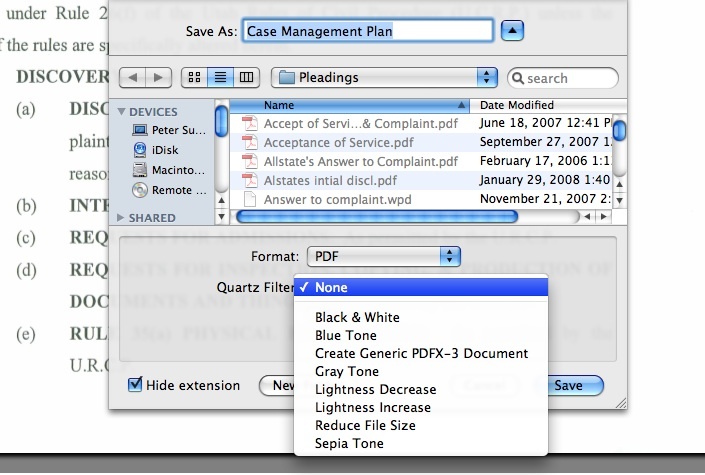 June 29, 2012: Update – I was just over at MILO and read New Jersey estate planning lawyer Victor Medina’s response listing his essential Mac apps. He included Dropbox and Alfred (or LaunchBar). I actually use both of those and, in fact, installed those early on but they so seamlessly integrate into my workflow that I forgot to include them on the list altogether. 1. BusyCal – Sync with just about anything and list view. 2. Moom – Getting windows set just right on the screen. 3. 1Password – Surprised this didn’t come in first, really. Tracks all your important passwords AND credit cards, driver’s licenses etc. 4. TextExpander – Too many joys to explain, from audience specific signature lines in emails to shortcuts for legal citations. 6. Pages – Because, eventually, you’ll need to write something with substance and formatted in an eye pleasing manner. 7. DEVONthink Pro Office – Heavy lifting, digging deep case and issue analysis. 8. Skitch – Screenshots, but importantly, screenshot filenames which tell you where the screenshot came from, including the page number of the PDF you were looking at when you took the screenshot. 9. Circus Ponies NoteBook – Collecting and building notes, depo outlines, thoughts, themes and exhibits, so that it can all get thrown together into a Trial Notebook. 10. Default Folder X – OS X’s continuing shortcoming? Finder. Fix it with this nice little utility that makes the finder truly useful, including the ability to add OpenMeta tags to files as you save them. 11. DEVONtechnologies Free Word Service – Ever need to delete bunch of line endings or change an ALL CAPS line to small caps? Go get this free utility to quickly and effortlessly manipulate text. 12. DEVONsphere – $4.99 on the app store. Get it and play with it. It can be a bit of processor hog, so set it on a weekly index schedule, preferably on a day you are not working. 13. OmniOutliner Pro – The old standby outliner. It is a great way to organize depo outlines and the standout columns feature allows you to sort by date, or do spreadsheet style calculations. 14. Parallels/WinXP (TextMap, WordPerfect) – Bleh. Occasionally you just get sucked back in… think of it as going into the storage room in the basement to pull some old file out of archives and then relish your return to the sunlit corner office of Mac OS X.
Ahhhh. The interesting tedious task of calculating dates. Delegate to staff and hope they get it right and you don’t blow a statute/deadline? Or, get out a big desk pad calendar and hold your thumb on the starting date counting backwards, then forwards, and forgetting where you started when the phone rings? Here’s a round up of calculators to help make it a bit easier on you or your staff. Court Days Pro ($2.99) is a ‘legal specific’ date calculator that allows you to ‘build’ a set of dates. Dates can be added/subtracted as court days or calendar days and long dependent chains can be built from a single trigger event. If the calculated date falls on a weekend or recognized holiday, the calculation can bump the date forward or backward to the next closest court date. Court Days Pro is handy for creating dates which are usually static and triggered by a single event, such as discovery schedules, time to answer, days until the statute of limitations runs etc. Once calculated, the dates can be exported directly to the built in Calendar app or emailed. 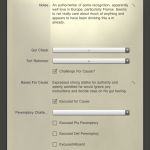 You could also check out Court Days (.99¢) made by the same folks, iPhone/iTouch only and fewer features. 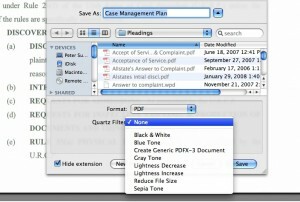 Both Court Days and Court Days Pro allow adding custom state recognized legal holidays. The reviews for this app on iTunes are somewhat negative. It appears from the negative reviews that people are having difficulty with navigation and input because none of the complaints make much sense if you spend a little time understanding how the app works. Recommend ignoring the iTunes reviews and playing around with the app for a little bit before you give up. Date Ranger (Free). Date Ranger is really simple on the surface. Two boxes, two dates and you’re off and running. Here’s the neat trick: once you have a date calculated, you can ‘swipe’ that date onto the other box. This makes calculating dependent sequential dates a breeze. HiCalc HD (Free) offers a variety of handy calculators, including a basic date calculator. It presents the dates in dd/mm/yyyy format which can be a bit confusing. HiCalc also displays the day of the week which will keep you, at least, from calendaring something to occur on the weekend but may result in you calendaring on a legal holiday. Lastly, DateInterval (free) provides a bare bones, knuckle dragging friendly count days forward from a date or the difference between two dates. Several free options exist for calculating dates on the Mac. First up is Date Calculator, a somewhat dated (2005?!?!) widget available here. The widget allows addition, subtraction and difference calculations for dates. FreeLawTools offers an online calculator that uses either court or calendar dates for the calculation, and will also exclude legal holidays/weekends from the result by shifting the day forward or backward as you desire. Finally, WolframAlpha. If you don’t already know, WolframAlpha “is an online service that answers factual queries directly by computing the answer from structured data.” So, of course, it can calculate dates. Speaking of WolframAlpha, they have just released for the iPad Wolfram Lawyer’s Professional Assistant ($4.99). The app offers up a unique set of reference tools for lawyers including, among other things, a Legal Dictionary, a quick reference for Statutes of Limitations for all 50 states, blood alcohol calculator, IP Address Lookup, historical weather, damages/estate planning/real estate calculators and statistical information. The date calculator can calculate business (i.e. court) or calendar days between two dates or forward from a specified date. But, if you want to count backwards… sorry, despite the fact that this App is provided by the world’s most famous online calculation machine, WolframAlpha, it can’t count backwards. Counting to a huge number of decimal places Pi? Check. Counting backwards on your iPad. Meh, not so much. Looking back at this collection it becomes obvious that the paradigm is shifting toward the iPad/iOS for ‘new’ or ‘innovative’ development. 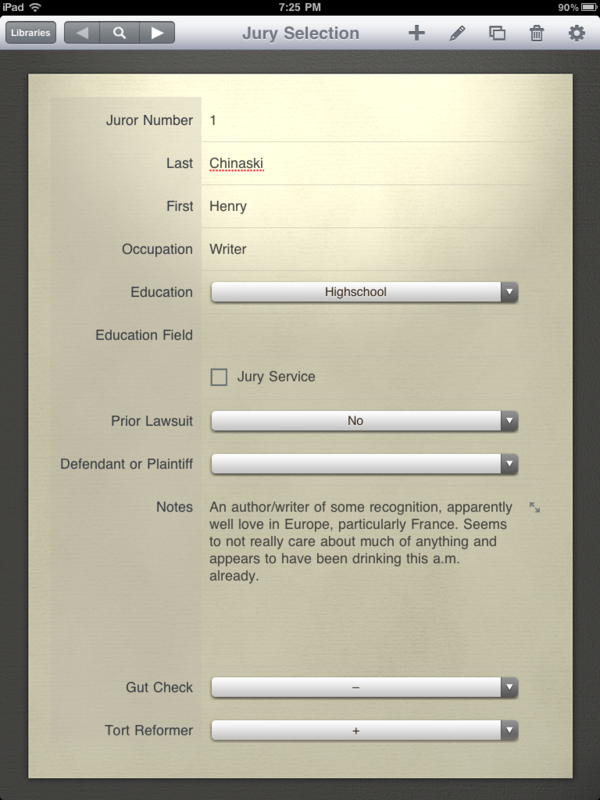 The best date calculator to be found is Court Days Pro, on the iPad. A date calculator widget for Mac OSX hasn’t been updated in six years and Wolfram just cranked out an iPad specific app, but provides nothing on desktop for legal reference. Interesting. Fresh from the mind of David Sparks (MacSparky), Siri can also calculate dates (and probably add them to your Calendar too). Thanks David… just when I had finally resolved to wait for the iPhone 5. Many, many, many people rely on Google not only for Gmail, but also for contact management, Gcal and Google Docs. Both Gcal and Gmail contacts sync very well with iPhones, iCal and Mac OS X’s Address Book. 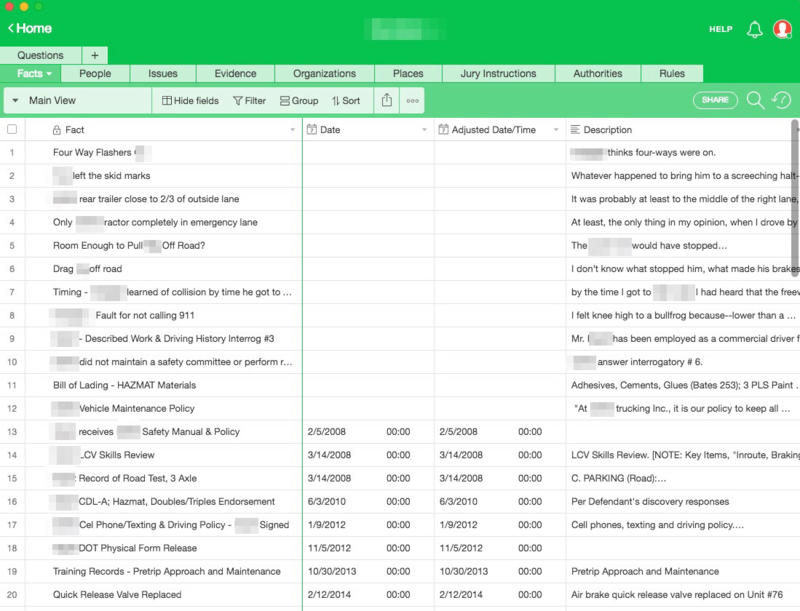 Gcal also offers the ability to painlessly share calendars in a workgroup, with a very low friction set up and virtually no administrative overhead. Similarly, if a workgroup so desired, they could also set up a centralized Address Book by requiring everyone to sync Address Book to a single Google account. In the past, Apple users could simultaneously sync to MobileMe and to Google services. Products such as SpanningSync and BusyCal/BusySync as well as built in Google sync made it easy to play in both worlds. Now, Apple has drawn a line in the sand by requiring the MobileMe user to designate their MobileMe account as the de facto dictator over calendar data. There are some work arounds, such as BusyCal’s setup. But that work around is difficult, error prone and not nearly as low friction as a plain vanilla Google to Google sync. So, for those who used both MobileMe and Google services, and allowed others to edit calendar data via Gcal, a choice must be made: (1) move over entirely to Google services; (2) risk a difficult high friction and error prone work around; or, (3) force other users to adopt MobileMe at $99/year. Given the sketchy work around, and potential loss of data through sharing, all of this is by way of an unfortunately long lead in for a product called SpanningBackup. From the developers of SpanningSync, SpanningBackup allows you to share your calendar and/or delegate email to staff or colleagues without worrying that they will delete or somehow otherwise bork your entire calendar/gmail/contact setup. 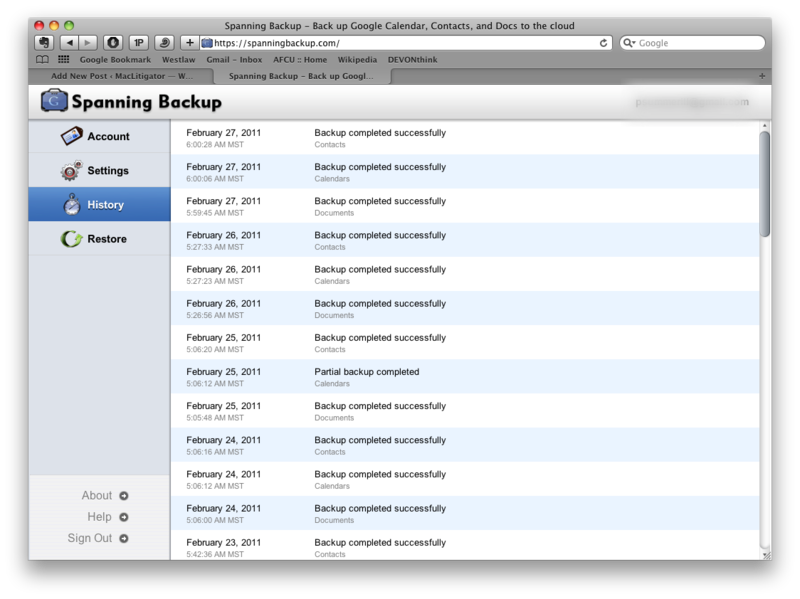 SpanningBackup does just what you might think: it backs up ALL of your Google data. All emails? Check. All contact data? Check. All calendars? Check. All Google documents? Check. There are two drawbacks to SpanningBackup at this time. First, data is backed up only once per 24 hour period. Second, with the exception of Google Documents, discrete pieces of data cannot be restored. 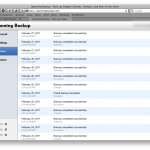 For example, SpanningBackup will restore a calendar to its earlier state for a previously backed up day. If a shared user somehow deleted your calendar data on Friday, you could then roll the calendar back to the previous state in place on Thursday. In this sense, SpanningBackup is more of a wholesale ‘revert’ than a back up and restore plan. 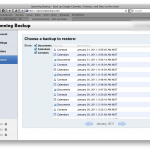 SpanningBackup is cloud based and costs $39.95/year, a cheap price for peace of mind. 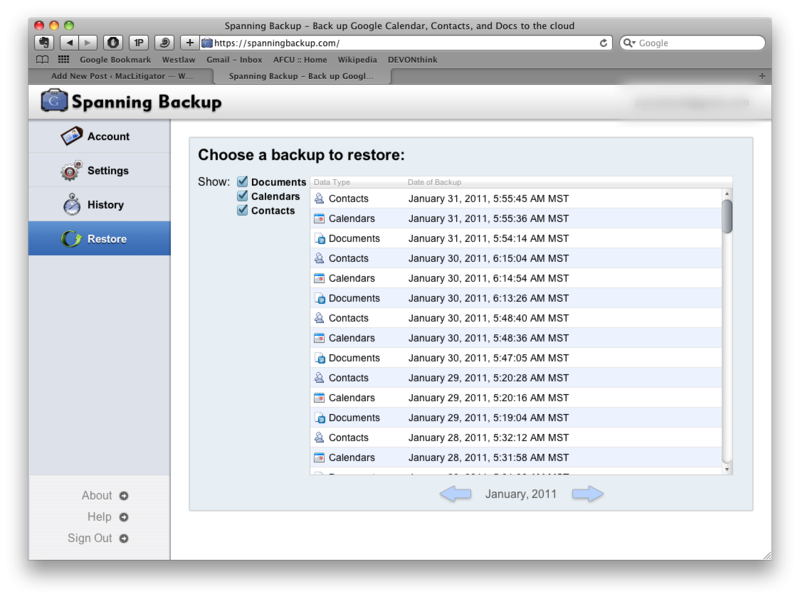 If you are using Google Apps or just Google to share data, SpanningBackup is well worth a look. Happy Holidays from MacLitigator… Here’s your gift, a Bento template for jury selection. While prepping for a jury trial recently, it became apparent that we needed a better way to track responses, information, decisions to strike, strikes for cause, peremptories etc. during jury selction, a.k.a. voir dire. Bento seemed a perfect fit for this task. 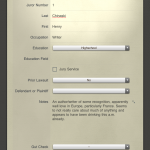 The template is designed to work on an iPad and, accordingly, incorporates as many checkboxes and choice lists as possible so that there is minimal distraction during jury selection. Jurors are sorted by juror number, and there are smart collections which filter as follows: Challenge for Cause; Plaintiff’s Peremptory (exercised); Defendant’s Peremptory (exercised); Remaining; Selected. 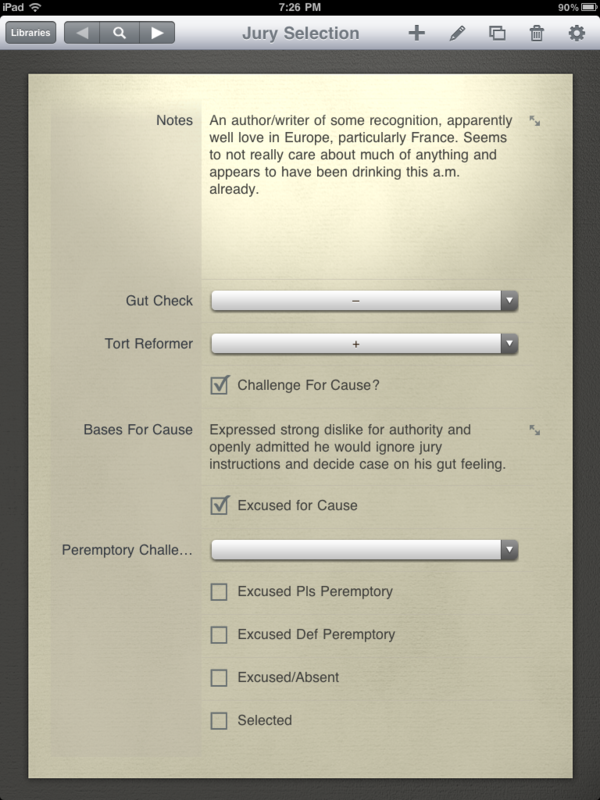 Several of the fields do allow text entry, such as the Notes, but other fields are intended to give you a quick fill such as ‘gut check,’ and ‘tort reformer’ drop down choice lists which allow a quick ranking of the potential juror. The template works great on the iPad version of Bento with one exception, smart collections based on a ‘choice list’ field do not transfer over. 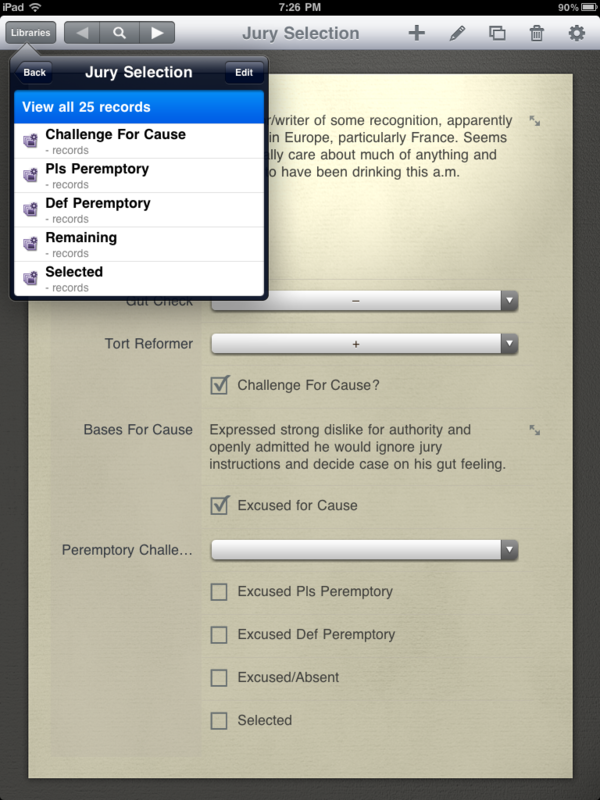 Accordingly, none of the smart collections in this template use the choice field to preserve functionality on the iPad. Enjoy and, if you come up with suggestions or modifications, please post in the comments. Bento on the iPad is $4.99, although having the desktop version certainly is worth the cost and syncs with the iPad wirelessly. Speaking of ‘jury work,’ there is an interesting iPad app out there that allows you to track the reactions of people who get seated as jurors during the course of the trial. It is called JuryTracker and, if you were so inclined, you could track juror reactions as the trial progresses. JuryTracker costs $9.99. Also available as a commercial iPad only app is iJuror, a stand alone app for the iPad that assists in the jury selection process. iJuror is also $9.99. O.K. I have five Google Wave invites available to give out. 5 and only 5. If you want to give Google Wave a try, post in the comments. Somebody (Apple? AT&T? a conspiracy?) may have killed the Google Voice iPhone Apps, but there is a new widget out that allows you to dial using Google Voice from your Dashboard, GV Connect . A huge plus to dialing using your GV number is that people will use it to call you back when looking at their caller I.D. However, dialing from that number is cumbersome, requiring you to log in to your google account, go to the GV web page, and then dial out. GV Connect does all this, right from your dashboard, lets you choose which of your registered phones the call will connect with and, perhaps most importantly, integrates with your OS X address book. Oh, and you can also SMS directly from the widget. While this doesn’t take the bitter out of your mouth at the loss of an iPhone app for GV, it’s at least a little sugar to make it more bearable. Another widget added to the collection, replacing the previous time zone clock set up, is iSlayer’s Organized. This hand widget gives you clocks, calendar, todo and a place to jot down your notes. On Mac OS X the ‘wow’ and ‘gee whiz’ factor of Widgets/Dashboard make part of the sale…. sorta like cupholders or a slot to hold your sunglasses in a new car. Widgets look really cool, the transition from the desktop to the Dashboard seems 21st Century, but, after using OS X for a while, Widgets kinda fall into the background and get forgotten. Recently, though, I’ve noticed my Dashboard and Widgets get used quite a bit. Here’s the set-up, explanation follows. 1. Date Calculat0r by Bright Light Software. You can calculate the days between two dates, add dates to a particular date, or count backwards. Great for scheduling orders and discovery cut-off dates. 2. Easy Envelopes by Ambrosia. Previously covered here, great little envelope application that hooks into Address Book. 3. Clock. Built into OS X but duplicated four times, to cover the time zones. Handy to have when trying to schedule a phone conference with someone in a different time zone. Clocks arranged East to West coast and local time popped to the side a bit for highlighting purposes. 4. Quickcal by “Smelly. 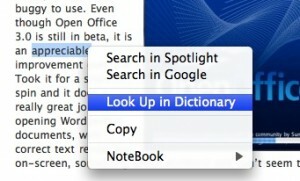 Puppy.” This widget allows you to enter natural language events and todos on your calendar. Awful handy when combined with the Clock set-up above. Simply type “Phone Conference with Super Expert Next Tuesday at 11:00 a.m.” hit return and it adds it onto iCal. (Donations encouraged. Easy Envelopes and Date Calculator are used as lead in freebies to attract you to the company’s other products. Quickcal is a solo project and a little PayPal could go a long way). Well, that’s it. If you have a favorite widget or widget workflow not shown here, brag about it in the comments! Not so long ago, the federal court clerk refused an efiling and requested it be refiled… the problem? The pleading had a scanned signature on it which showed up in nice blue ink and the federal efiling system required black and white. A quick attempt to save the document as black and white from Adobe Acrobat Pro failed, as did the attempt to print as black and white back to Acrobat Pro…. grrr. However, opening the document in Mac OS X’s built in Preview provided the solution… Save as gives the ability to save as black and white, even though the $300 Acrobat Pro refused to do so! 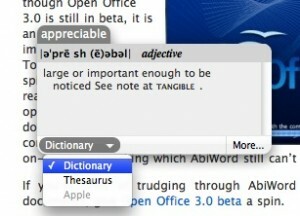 A TUAW blogger recently posted about a ‘plug-in’ that provides the ‘missing’ thesaurus function on Leopard. Chuckling smugly with the self-satisfied knowledge that Mac OS X already had built in Thesaurus (and Oxford Dictionary, and Wikipedia), I scrolled down to the comments only to learn something new myself. 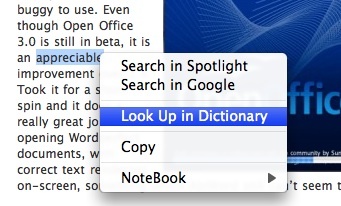 If you command-click (or right click) on a highlighted word you get a choice to look up the word in Dictionary (which also has tabs for Thesaurus and Wikipedia). But, what I didn’t know was that if you hover the mouse over any given word and hit control-command-d, you get this beautiful, useful pop up as seen below. What’s more, moving the mouse around will alter the content of the pop-up depending on which word the mouse is currently hovering on. It almost always seems the commenters have better suggestions than the blog itself…. *hint*. Big ups to TUAW commenter Michael Sternberg for besting the TUAW staff, and me too. Collecting, saving, creating & reviewing tips, hints, tricks & hardware/software for lawyers and staff using Macs in litigation.